When I say pattern mixing, do you instantly think, "Oh, no! It would look like I dressed in the dark!" Mixing unexpected patterns and prints has become a huge fashion trend, and I for one like it! Of course, there can be a fine line between looking stylish, or looking like a hot mess! I'm here to help you get it right. Go bold with pattern mixing, or keep it simple-the choice is yours. Either way you will look more stylish and more than likely you will get twice the use out of the clothes you already have. Look chic and on-trend. Yes, you can look stylish and chic by mixing several patterns in one outfit. Use MSP's "does it mix" chart + 6 mixing guidelines shared in this week's article for members, "How to Mix Pattern Like a Fashionista". This informative article will help you get it right every time. No more guessing. Look at MSP's mixing chart to find the pattern you want to mix-then see what you can wear it with! It's EASY-Peasy style for you. THIS week, MSP shows you how to mix patterns, prints, florals and more! Give pattern mixing a try! Mixing prints and fabric patterns is a fab way to show more style personality. Just a touch of pattern mixing will give any outfit a touch of sass. It's also great way to breathe new life to some items in your closet that have been neglected, or not worn for a long time. No need to buy more clothes, instead learn how to mix a few prints and create some fabulous "new" looks! Get a MissusSmartyPants Style Membership Today! 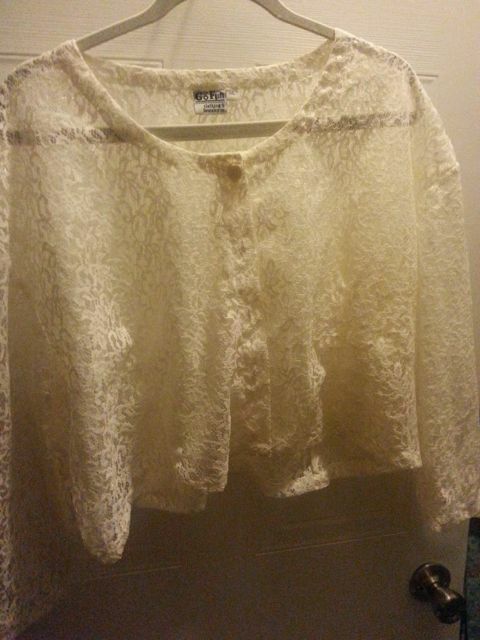 "Hi MSP, I need help with these 2 tops that I love but can't seem to make work for my Type E body. 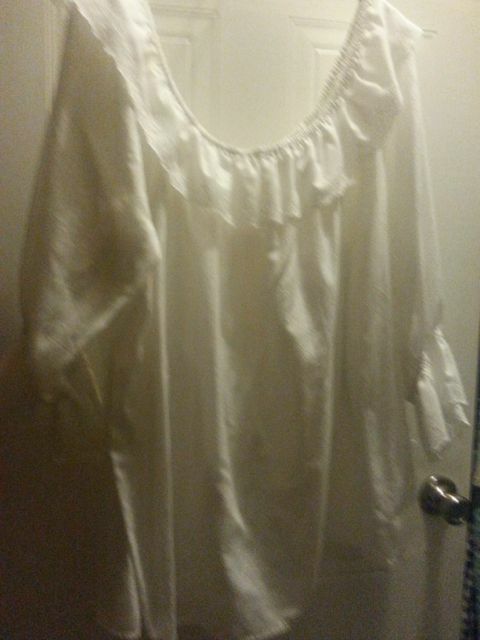 One is a short white lace jacket, and one is a large white peasant blouse. These would be good candidates for an upcoming newsletter if you'd like. Here are photos of them. Thanks, Laura B"
"MSP, how do I style these tops?" For the short lace jacket: the best look is to wear it over a dress or monochromatic outfit (like the gray one shown above). A deep v-neck elongates your neck (vs. a crew or rounded neckline) and adds more visual space to your torso. 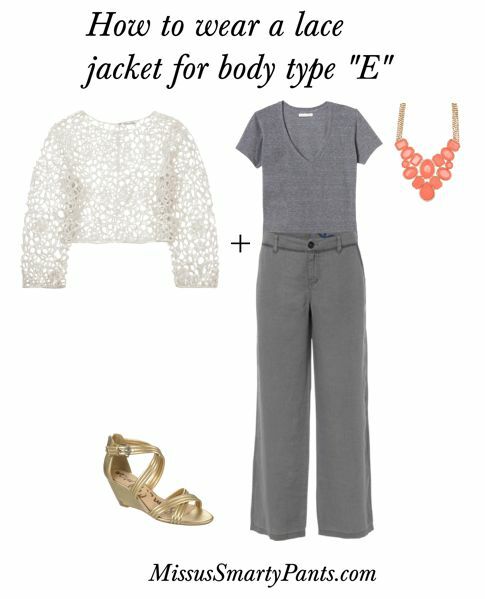 Add a low wedge heel to balance out the fuller cut pant that is just right for your body type! For the peasant tunic: to make the round (not as flattering) neckline more slimming...add a long layered necklace for an added vertical line on your upper body. Then wear a straight bottom and a slight heeled shoe. Add a "pop" of color with your handbag! FYI: Notice I added a belt to this suggested outfit. Yes, a belt. 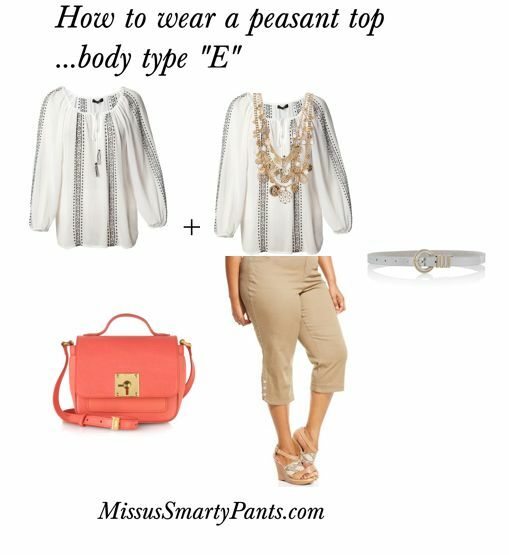 You can wear a belt, Ms Body Type E. Give it a try. Here's how a skinny belt works for you...it is in the same color as your top. This gives you a touch of waist...and you can pull the top up a bit so it "blousons" or has fit and flare to it. This week’s Mission: It's a Jewelry Box Raid! Wrap 2 necklaces together to create a unique look! Dig into the depths of your jewelry box this week! 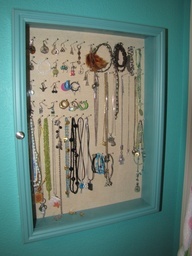 Let's pull out those long forgotten necklaces, earrings, brooches, and lockets, etc. and give them a second chance to bedazzle you. Do you have a long strand of pearls? 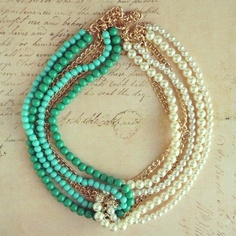 Layer them with a long chained locket for an eclectic look or simply tie them with a knot! Pull out a one-of-a-kind bracelet and plan an outfit based on the colors of that bracelet (you can do this with a brooch or scarf too). 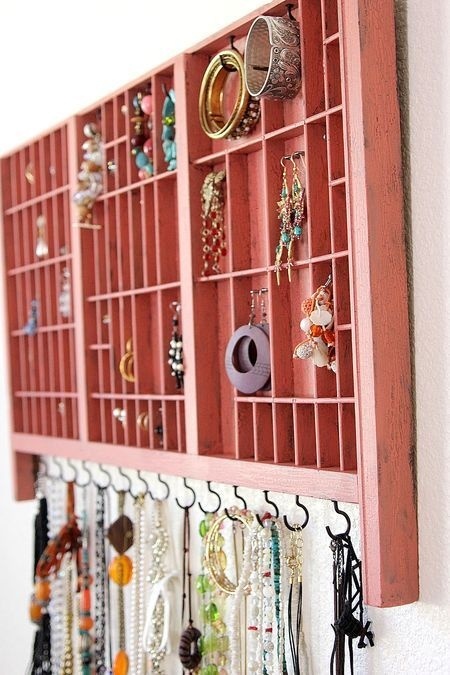 Get creative and have fun with your long-lost jewelry! My 2 jewelry boxes and top drawer (yes, I have a drawer full of jewelry as well as two jewelry boxes!) are desperately in need re-organizing. There’s lots of great stuff in there I really should be wearing--but I'm not because my jewelry is a mess. This week I’m going through it and I'm determined to wear something “new”. Won't you join me? Challenge yourself with this week’s Style Mission and together we will “Show Your Style” SYSter! I've been subscribing to your service for a couple of years, and I have been happy with my new style (where I had none before). When my 4 year old asked me if she could pick out my clothes for work tomorrow, I hesitated. Then, I agreed, reserving the power to veto. 1) Even when my weight fluctuates, my closet ONLY contains clothes that fit me right. 2) Everything in my closet feels good to me, and looks good on me. 3) My clothing colors complement each other. I couldn't make any of those statements two years ago!!! There's probably also some natural talent in play, in that she's not putting florals and plaids together. But having a closet full of clothes that fit right, feel good, and look nice together gives her a great base to work with!